Organically Grown, No Pesticides, Non-GMO Bi-ColoredSweet Corn, per ear. Sweet corn is loaded with lutein and zeaxanthin, two phytochemicals that promote healthy vision. A midsize ear also offers a helpful 3-gram dose of dietary fiber. 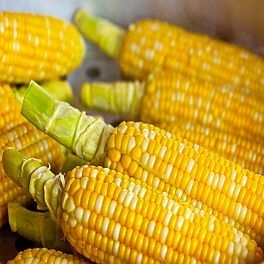 An ear of corn has about the same number of calories as an apple and less than one-fourth the sugar. Choose USDA organic corn, GMO crops are forbidden under organic standards.